We all need an editor. Sure, asking friends or family can help, but sometimes you need an impartial set of eyes to look over your work. Having someone else to catch those simple errors or mistakes in flow is necessary for any writer. Many apps have arrived online over the past few years to help. A mainstay has been the Hemingway App, and with good reason. The homepage of hemingwayapp.com greets you with beautiful simplicity. Everything the app does is explained in neat text on one screen. Read everything there, and you know how to use the app. Proceed, and begin editing. 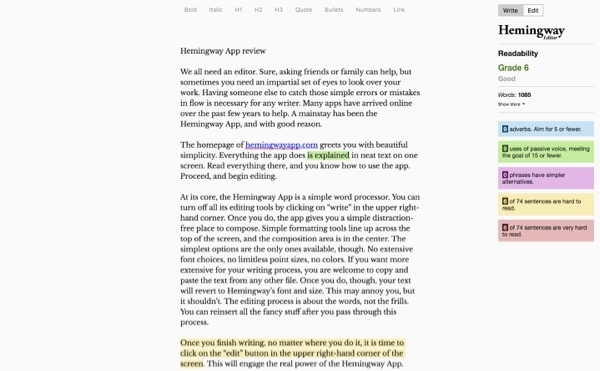 At its core, the Hemingway App is a simple word processor. You can turn off all its editing tools by clicking on “write” in the upper right-hand corner. Once you do, the app gives you a simple distraction-free place to compose. Simple formatting tools line up across the top of the screen, and the composition area is in the center. The simplest options are the only ones available, though. No extensive font choices, no limitless point sizes, no colors. If you want more extensive for your writing process, you are welcome to copy and paste the text from any other file. Once you do, though, your text will revert to Hemingway’s font and size. This may annoy you, but it shouldn’t. The editing process is about the words, not the frills. You can reinsert all the fancy stuff after you pass through this process. Once you finish writing, no matter where you do it, it is time to click on the “edit” button in the upper right-hand corner of the screen. This will engage the real power of the Hemingway App. With editing mode engaged, your text becomes colorful, and a stats bar appears on the right side. This area of the screen displays the value of the app. The first thing you see is the “readability” of your writing, measured in grade level. This is based upon sentence structure and level of vocabulary used. Contrary to what you might think, the lower the grade level, the better. Ernest Hemingway’s own writing and books have been analyzed, and the consensus is that his most popular works are at a 4th to 6th grade reading level. Why is this important? Why not try to make your writing be at a 12th grade level? The answer lies in your audience. Just because you are writing at a simpler level to read does not mean that your message has to be simplified. For example, why say “I am attracted to you in such a manner that is virtually unidentifiable in description other than to say that I feel this way toward no other human being on this or any other planet in the universe, past or present,” when you can say “I love you”? Keep it simple. If more people can understand your writing, then more people will read your writing. It’s as simple as that. The app only gives you a warning when your writing is at the 12th grade level, which should be reserved for academic papers. Below the readability analysis, a drop-down box of basic stats appears. This gives you facts about your writing that you may or may not find useful. If you do not find these stats useful, everything but the word count can be hidden from view. Below the stats area is the bread and butter of the Hemingway App. A legend of five colors appears, corresponding to the highlighted portions of your writing. These are five important areas to focus on when reviewing and editing. The app can discover adverbs, use of passive voice, phrases or words with simpler alternatives, hard to read sentences, and very hard to read sentences. These areas are highlighted in your text, and the color-coded boxes on the right display statistics with suggestions inside. For example, the app is not telling you to cut all adverbs, but it will suggest that you bring your count of adverbs down below a certain number relative to the length of your writing. Sometimes, the app misses things. Other times, the app highlights words that end in “ly” that are not adjectives. It’s not quite perfect, but it catches at least 95% of these typical problems in writing. The app will not correct things for you. You still have to do the work, which is how it should be. It will suggest simpler alternatives for the words and phrases highlighted in purple, but that is the most direct way in which the app will intervene. Whether to take the app’s advice is completely up to the writer. 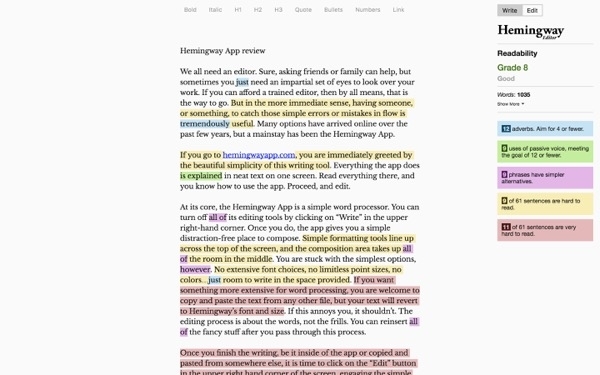 But chances are, you will perform many edits based upon the Hemingway App’s suggestions. The app can handle a tremendous amount of script, too. I’ve copied and pasted up to 75,000 words of text into the editor and it analyzed it in seconds. Quite impressive. The online app is free to use, as well. The only drawback is that it will not save your work. To get that feature, you can buy the desktop version of the app, which goes for $19.99 and works for both Mac and PC. The desktop app comes with many benefits, including the ability to import and export to and from the most popular types of text files. Also, the app now has the option to publish your writing directly to your account on either Medium or WordPress. With its simplicity and power, I find the Hemingway App to be an essential tool in my writing arsenal.